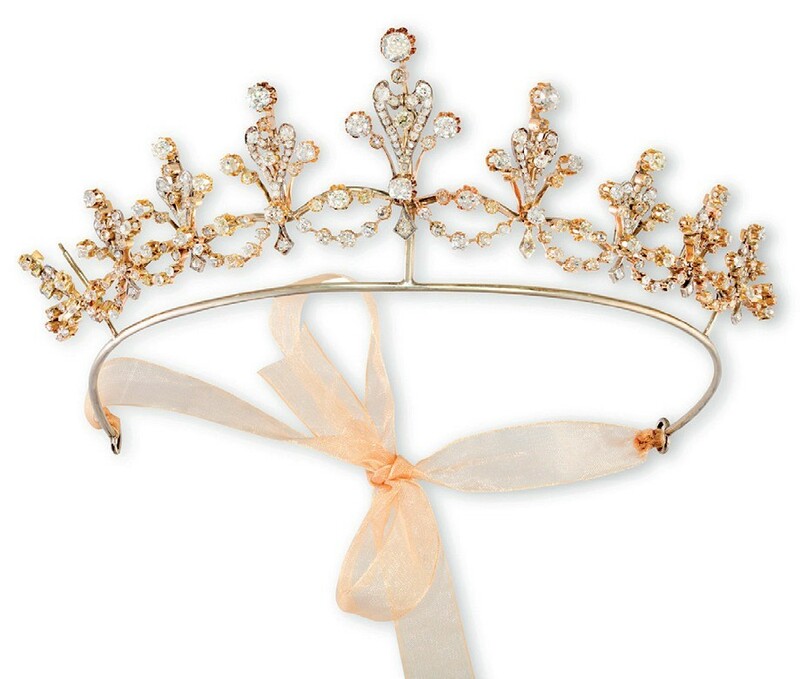 Deemed a little ostentatious in some circles, tiaras have enjoyed a surge in popularity in recent years, particularly in Russia and the Baltic states where jeans and a diamond fascinator are de rigueur at informal high-society events. 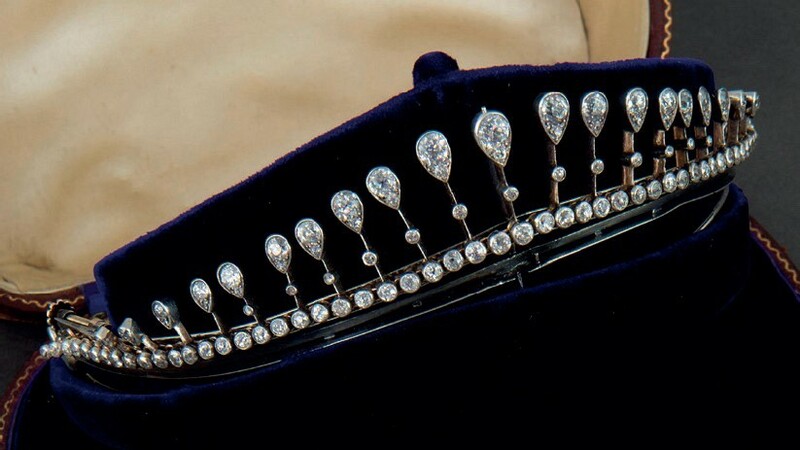 Victorian diamond tiara, £19,000 at Chorley’s. The Chinese demand for tiaras has also spiked, giving a lease of life to a much-admired but somewhat redundant form. The most desirable are the more wearable and delicate versions and particularly those that convert well to necklaces. Three diamond examples sold at recent regional sales are pictured right. The tiara offered in Chorley’s (20% buyer’s premium) Country House Sale on Januaury 29-30 was from the collection of the late Jane Rook, wife of the late Major Laurence Rook MC, who lived at Beverston Castle, near Tetbury. Bonhams’ Private Collections sale in London on October 3 featured selected contents from the estate but the Prinknash Abbey firm had secured the statement pieces from a fine jewellery collection. 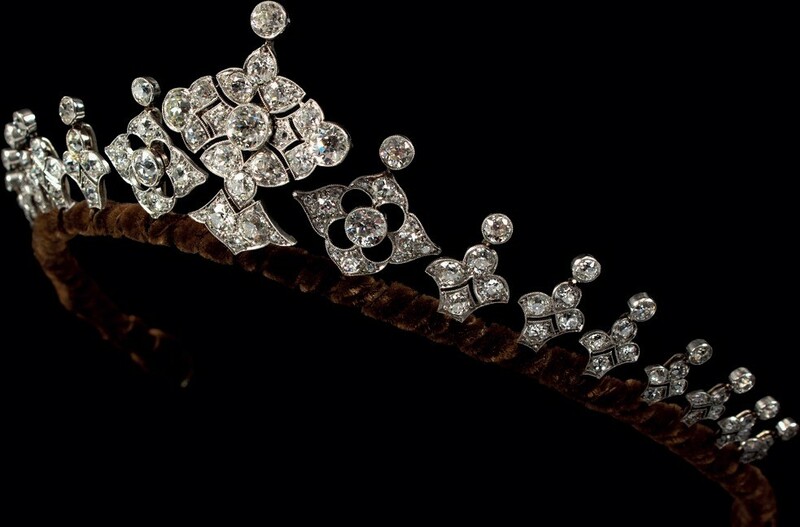 The tiara, with a total carat weight of 22.2cts across nine floral pinnacles, doubled hopes at £19,000. From the same consignment was a pair of natural pearl and diamond ear pendants – sold with certification stating the pearls were saltwater and a grey-yellowish colour of slightly uneven shape – which sold at £38,000. The tiaras offered by Lawrences (22% buyer’s premium) of Crewkerne on January 17 and Adam’s (20% buyer’s premium) of Dublin on December 4 were both combination jewels, with sections that could be worn as a necklace. They sold at £13,500 and €26,000 (23,500) respectively. Lawrences’ vendor was the grandaught of the original owner, Alice Tall. She was pictured in the catalogue dressed in her Edwardian finery wearing the piece as a necklace. This Edwardian tiara-necklace combination at Adam’s was very similar in design to that owned by Crown Princess Mary of Denmark, a piece which she has worn for banquets, state visits as well as when photographed for Vogue. The design, here with around 15 carats of brilliant, cushion and rose-cut diamonds, was popular throughout the 19th century and into the early 20th century.